Facebook Ads: Thumbs Up or Down? Facebook ads – to buy them or not? Considering how many posts are circulating on both sides of this issue, the choice is not an easy one to make. My views aren’t set in stone just yet, but I’d like to share them with you. I like Facebook for marketing, and I frequently recommend it to my clients. I especially like the business friendly features the platform added to its pages. But, while I understand its desire and need to generate revenue, my belief is that the push for more advertising goes against the social media site’s core concept. Facebook has always been a place for social connecting, not hard selling. I recommend the platform for engaging with a brand’s current and potential fans; as an avenue to breed familiarity, build trust, and service those fans. With the new, no cost features Facebook has given its business pages it is relatively easy to highlight new products, services, special deals, etc. For my philosophical purposes, that is good enough. Of course, I will not refuse a client who wishes to advertise on the Facebook platform. And lately, there has been push back against the reports that as a marketing venue Facebook isn’t successful enough to be considered truly viable for businesses. But most of those countering reports stem from one marketing analytic organization, which lists Facebook as one of its main clients. It would be nice to see analytical interpretations done by other associations as well. The research I have done so far has indicated a proclivity toward unhappiness over Facebook’s push toward monetization via its ads. Some merchants feel the rule changes shift the playing field so that creativity and traditionally successful strategies can be undercut by competitors who are willing to pay for more exposure. 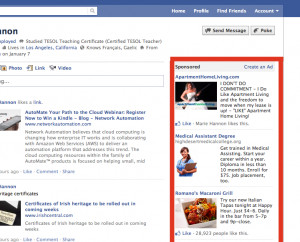 Personal profile users are not happy about being bombarded with ads all over Facebook. And some of the platform’s newer marketing systems target users via methods that are more intrusive on privacy than ever before. For example, merely liking a business page can be reason enough for a user to turn up in a “sponsored story.” Also, the platform is using cookies placed on profile users’ computers to track their off-Facebook activities in order to tailor ads for them, as opposed to just relying on the preferences they list on their profiles. 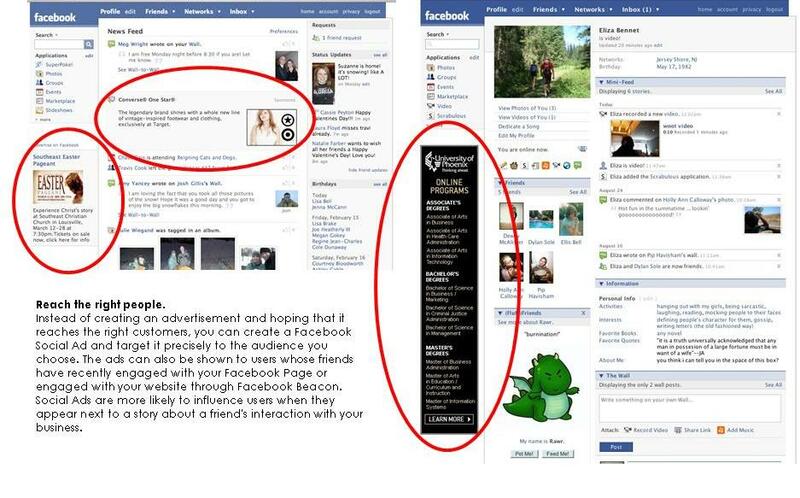 This is similar to the methods Google uses for its advertising. Facebook claims that its users have the ability to opt out of this level of intrusion. But how many users on average know how to change their settings to do that? For the general public who wants to connect, socialize and engage with friends, this is a bit too much privacy to sacrifice. There is also talk that Facebook may eventually begin charging for the special features it now offers to business pages for free. This may happen especially if the platform’s ads don’t generate the revenue for which it is hoping. One recent study actually concluded that more positive response is coming from the free features than from the paid ads. That said, it stands to reason that Facebook might want to push everyone into a scenario where every type of special promotion will cost. I can’t say so definitively, but I believe a move like this will turn more people away from marketing on Facebook – especially when we consider how many new social media platforms are cropping up almost daily. It’s only a matter of time before one (probably more) of them rivals the number of users that Facebook currently has. While I understand its motivation, I feel that Facebook is trying to make itself into something it wasn’t meant to be. Its current structure plays an important role for its social clients as well as its business pages. Change can be a good thing, but sometimes completely reinventing oneself can have undesirable outcomes. In its quest to procure greater profit margins, I wonder if Facebook may be going too far in a direction its users do not wish to go. How do you feel about all the new methods for paid ads that Facebook is pushing? Do you approve of this new direction the platform is taking? Will it help or hurt, in your opinion? Please share your thoughts in the comments section below. This entry was posted in business online, Facebook, online marketing, online merchandising, Social Media Management/Marketing and tagged business online, Facebook, Internet Marketing, Jeanine, Social Media Management/Marketing, Vecchiarelli by Jeanine Vecchiarelli. Bookmark the permalink.